Two days left of Tiki The Snow Away means two more Surf Girls! Hawaiian Suf Girl is near and dear to my heart as it adds some extra tropical goodness to mix. If you want to share a tropical drink during the month of January, you have two days left to use the hashtag #TikiTheSnowAway on Instagram and Twitter, or tag u/homebargirl on reddit. This gurl has been surfing for days. Look at her tan! To the Surf Girl trio of Denizen Aged White, Senior Blue Curaçao, and Coco Lopez we add Passion fruit! Yea! It really adds a unique tartness in a way that Lime alone just can’t achieve. 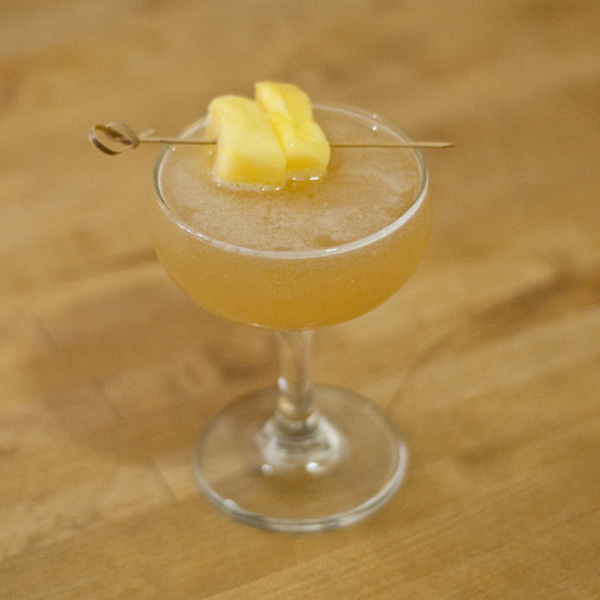 Lastly, Pineapple gives a great backbone and plays so well with the rest of the ingredients. Combine ingredients and blend for 7 seconds. 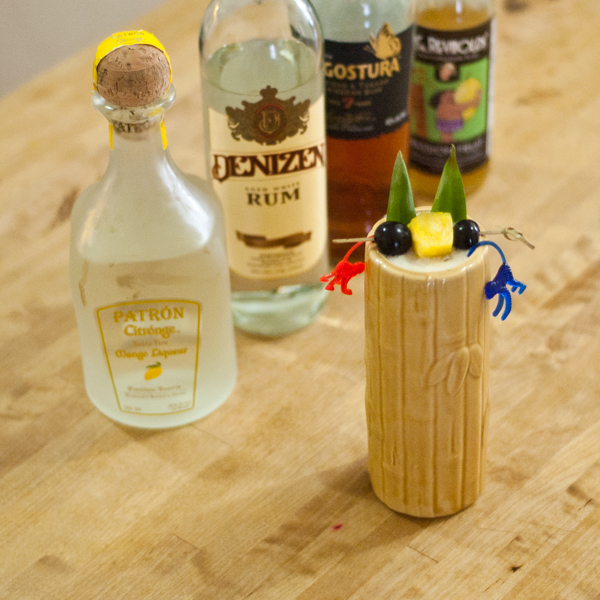 Pour in a 10 oz Surf Girl Tiki Mug and garnish. *Always unsweetned, 100% Pineapple Juice not from concentrate. This is critical or the drink will be too sweet. Well, it’s officially Frozen Drink season. It started with National Daiquiri Day on Sunday and now, I just want everything frozen. ALL OF IT! Today’s frozen Tiki drink is part of an ongoing series of Rum cocktails + monkeys. “Why are we blaming the monkeys?” you may ask. Well, they’ve taken over my Home Bar and have drunk all my Rum! Hello lil conniving Monkeys. Leave my Pineapple Spear Bunny Ears alone! 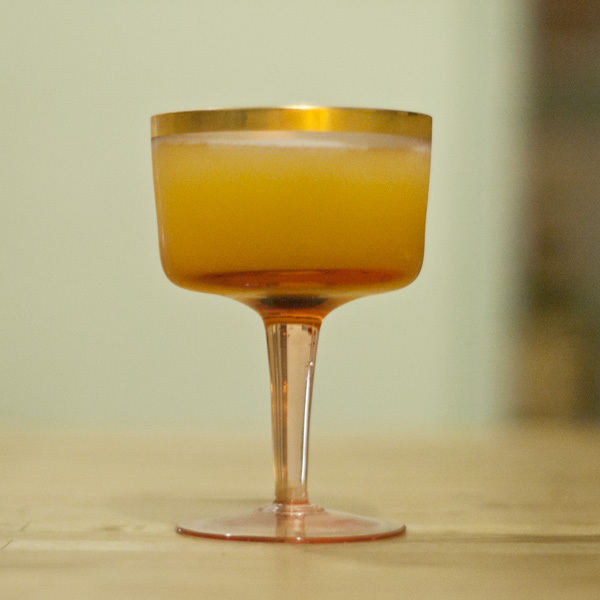 The inspiration for this particular version of Blame It on the Monkeys comes courtesy of Patrón Citrónge Mango Liqueur. This stuff is damn tasty and perfect for all our tropical cocktails. I luv it. To this we add two kinds of rum, a bunch of other fruitiness and a blender. Blend baby, BLEND! 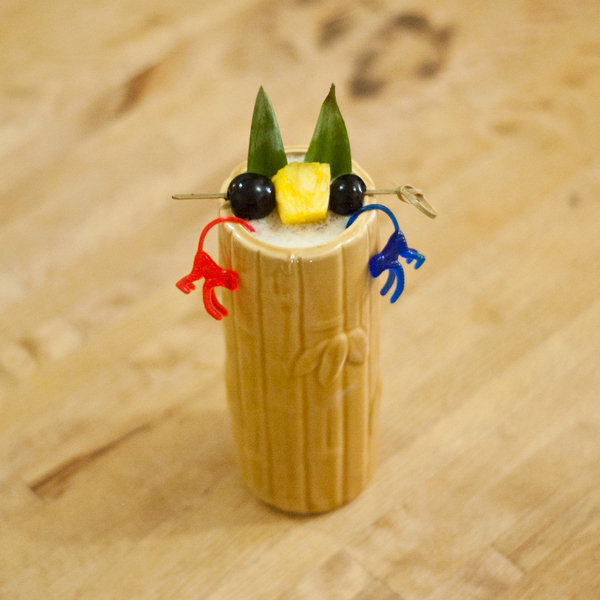 Garnish: Pineapple Spear Bunny Ears, Pineapple, Maraschino Cherries, Monkeys. Combine ingredients in blender and blend for around 7 seconds, or until nice and frothy. Pour into Tiki Mug and garnish. **You may think this is a lot of sweetness, when making blended cocktails, you have to bump up the sweetness to compensate for all the ice. Feel free to reduce to 1/2 oz if you like. Cheers to y’all in these hottest of times! May the Tiki gods favor you and protect you from these crazy monkeys! Thanks to MBooth for the Patrón Citrónge Mango Liqueur! Happy 4th of July Weekend to everyone! I’ve been thinking about what I really want to drink/serve at my 4th of July party and honestly, I just want a Daiquiri! Daiquiri Prrrrrrrrrty! If you want to join in the fun on Instagram and Twitter, use the hashtag #4thOfJulyDaiquiriParty. That being said, “I just want a Daiquiri” means so many things to me, and there are many variations one can make by adding one or two ingredients to the Rum + Lime Juice + Sweetness formula. I mean, just by switching out the Rum itself or changing from refined sugar to turbinado sugar can have a profound effect on the flavours of the drink. First, let’s start with the basics. 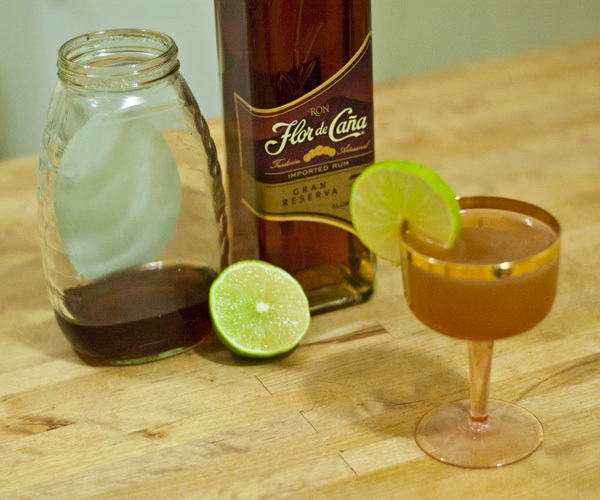 Flor de Caña 7 Year is my all time fave aged molasses Rum. It is viscous as hell, creamy, with caramel smoothness for DAYYYYYYYS. It will make the best damn Daiquiri you’ve ever had. No lie. Combine ingredients over ice and shake. 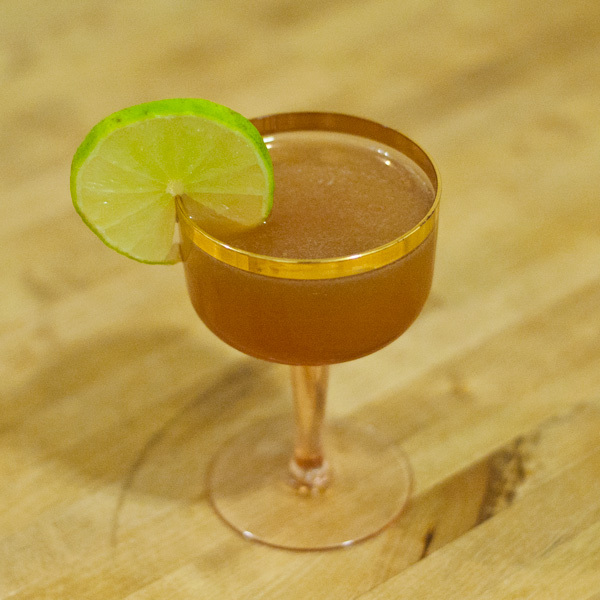 Strain into coupe and garnish with Lime Wheel. 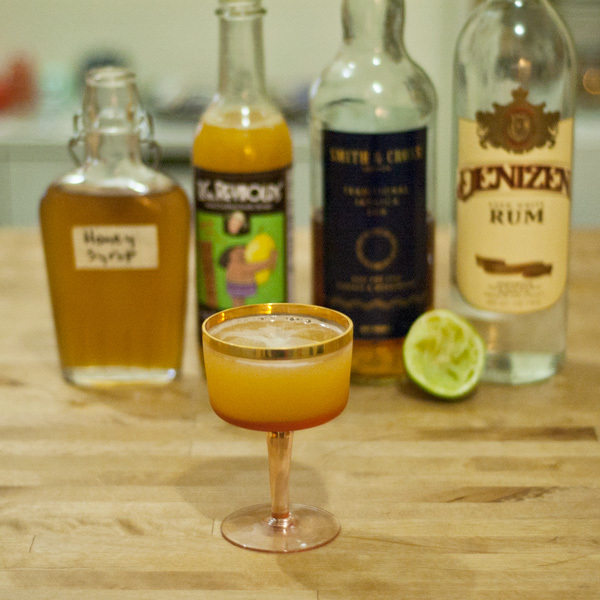 Now that we’ve got a nice basic Daiquiri down, we can get a little more creative. 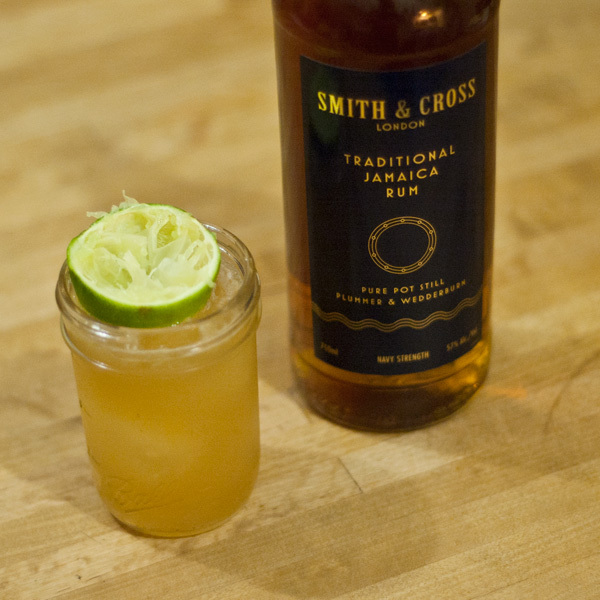 For this one, we’re going to use a funky Rum from Jamaica that has been aged in the UK: Smith & Cross Navy Strength Rum. Our sweetners are going to get more complex with the addition of Falernum and some of my patented (I wish! Soon!) DD Mix. The spice set will come from the funkiness of the Smith & Cross, DD Mix, and one dropper of Bittermen’s Elemakule Tiki Bitters. Highly recommend these bitter’s y’all! In tin combine ingredients over ice and short shake. Pour entire contents of shaker into mason jar. Garnish with one of the Lime halves you used when you juiced the Lime. For this next one we’re going to go to the books and use a totally fabulous recipe from the 1970’s, Don’s Special Daiquiri. This variation was created to commemorate Don the Beachcomber and use his 1934 Daiquiri recipe while adding a couple of modifiers. I altered the recipe a tad because I felt it needed to be a bit more tart. Combine ingredients over ice and shake. Strain into a chilled cocktail glass, garnish with Maraschino Cherry. 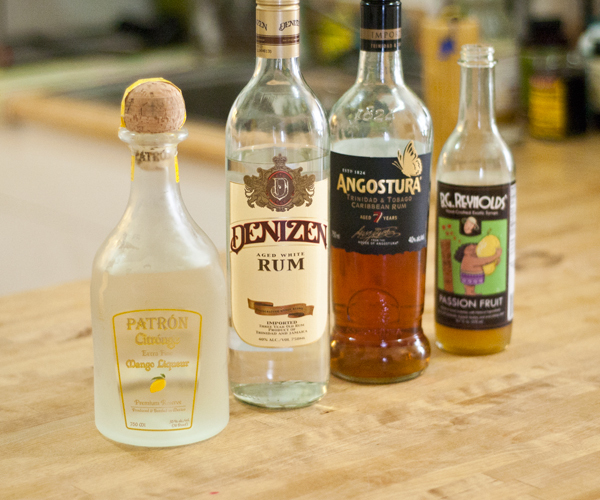 Lastly, we’re going to use three different Spirits in a Daiquiri that I named after my family. 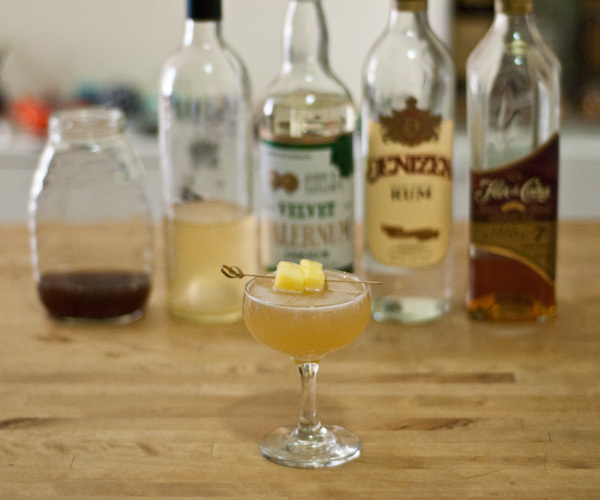 It uses two kinds of Rum and one of my all time favourite infusions, Pineapple Plymouth Gin. Combine ingredients in over ice and shake. Strain into coupe. Garnish with Pineapple. Well, that’s it for this roundup. If you’re looking for more recipes, you could always try Or-zah Gabor or a classic Hemingway Daiquiri. Happy Independence Day USA! A few of us on Instagram have started a #RumForTheHills hashtag and so I thought I’d start with a really fabulous Daiquiri recipe from the 1970s. 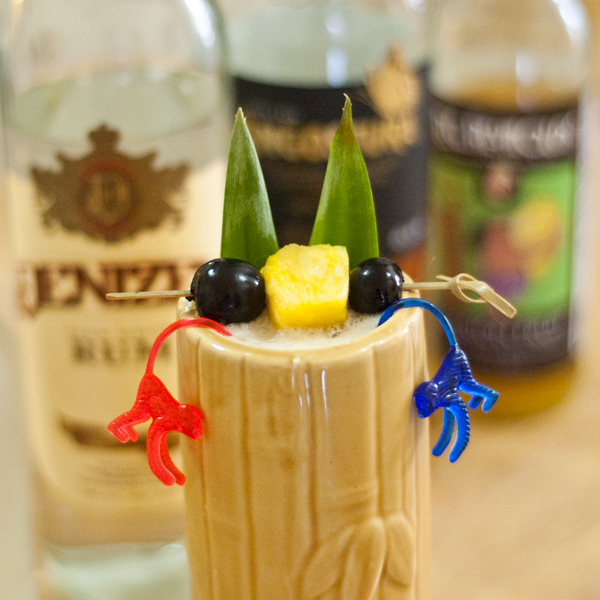 I got this recipe from the Beachbum Berry Total Tiki app and it’s a knock out! If you don’t have this app (or one of his books) you need to get on it! 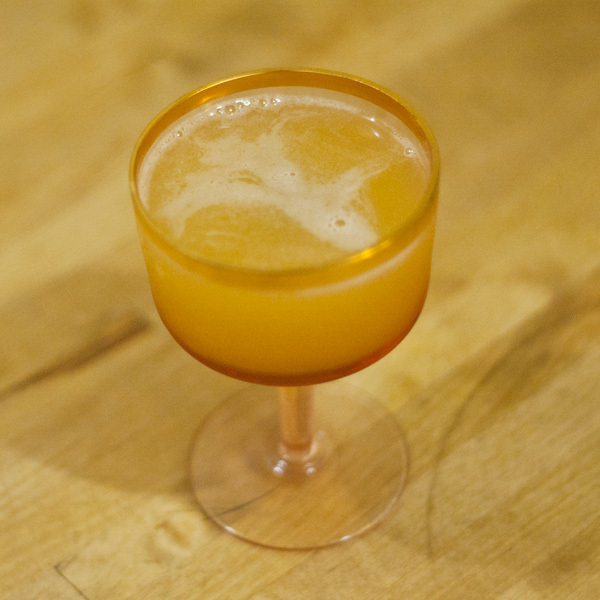 This Daiquiri is a version of Don the Beachcomber’s 1934 Mona Daiquiri. Now, of course I made a couple of modifications, namely, 1/4 oz more lime juice and 1/4 oz more Rum cause I like my Daiquiris tart and boozy. Hope you enjoy and if you wanna join in the party, use #RumForTheHills on Instagram!